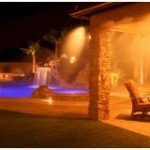 Before the Summer months temperature arrives in Phoenix, you will want to hook up the your mister lines and test the pump and/or water supply and make sure that your system is working properly. Be sure to examine your mist system lines for any kind of leaks. If you are using stainless steel mister lines, leaks shouldn’t be a problem. Inspect the joints and connectors of your mister system for leaks. If your system has plastic lines, you’ll want to inspect all of your mister lines for cracks and breaks. These can occur due to the dry atmosphere and colder temperatures that occur during Phoenix winters. The next thing to do is to make sure the mister system nozzles aren’t blocked. Many regions in Arizona and the Phoenix area contain hard water which means mister nozzles may possibly be clogged by mineral deposits (such as Lime and Calcium). It might be possible to just clean the debris off of the top of the nozzle but if the deposits are in the mister nozzle hole, you will have to find something small enough to poke through whatever is clogging the mister nozzle (a needle usually works well). Be careful not to enlarge the original hole! It may be easier to just replace all of the mist nozzles as it usually takes less time than attempting to clear out each nozzle. Also, the cost of misting nozzles is reduced when if you decide to purchase them in bulk. We highly recommend cleaning your system before turning it on at full capacity. If your heads are blocked, turning on your misting system will cause pressure that may cause cracks in your system that may result in costly damage. Getting a new patio for your back yard or garden isn’t all that difficult so long as you have some help. Your Phoenix professional landscaper can help to assure that your original design is compatible with your property and your climate. One of the most common problems with the new patio installation is the lack of professional help in the planning and design. Quite often this creates real issues when it comes to the overall look and how the finished product plays out. The best and most professional method of diagramming and planning for your patio, your outdoor kitchen and anything else that you’re considering building outside will be with a professional landscaper to advise and to guide you. Consider all the aspects of the patio before you begin and if you need help with your planning, contact your Phoenix area landscaper. With Spring comes gardening fever! We’re all anxious to begin planting so that we can reap what we sew (literally!). There are a number of various plants that will naturally ward off bugs that could potentially cause damage to your vegetables or flowers. In turn, you will end up using less chemicals and make both your yard and food safer. Here are a few plants to consider if you are looking to plant an organic garden in Arizona. Bay Plant: wards off moths, caterpillars and ants. Chives: wards off crickets, aphids and borers. Garlic: wards off aphids, grasshoppers and crickets. This the ideal plant to place around roses, in your vegetable garden and around your fruit trees. Basil: resists flies, caterpillars and mosquitoes. Marigold: wards off crickets, slugs, aphids, caterpillars, grasshoppers and white flies. Onions: wards off ants, aphids, borers, moths, crickets, and grasshoppers. Rosemary: resists insects including fleas, mosquitoes, moths, beetles, crickets, and grasshoppers. Sage: wards off mice and repels crickets, moths, and grasshoppers. Thyme: wards off flies, white flies and cabbage worms.